It’s that time of season where we like to feature each of our Special Projects so that you, the Make Music New York community, can have a better understanding of the many great ways to enjoy our music celebrations on Thursday, June 21st (mark your calendar!). Look for regular blog posts outlining events across neighborhoods and boroughs, featuring amazing and engaging musicians from the New York area. If you missed our past special project posts, be sure to check them out here, here, and here! James Burke: Hi John! I’m thrilled to be presenting your latest special project “Muscota Marsh Harmony” as part of this summer’s Make Music New York on June 21st. I know that you have worked with MMNY in the past as well. Can you share with our fans some of your history with the festival? John Hastings: Hi James! I’ve been working with MMNY since 2012 when I did a audience participation piece called “HUM 7 8 9” where people would join with me in humming along with the ConEd substation in DUMBO. It was a place I discovered by walking one day and it was great fun to integrate the city’s sound environment with New Yorkers into a sonic seance of sorts. I did that piece a few times as well as a performance of Christian Wolff’s Stones in Red Hook, at the beach near Valentino Pier Park in 2015. As with my humming piece, the audience were the performers as we all collected stones from the beach and made sounds with them together . One of the joys of MMNY is having people from all walks of life engaged with sound and music in all sorts of ways. JB: Back to “Muscota Marsh Harmony”, can you explain the program for our followers and speak to the inspiration behind the concept? John: Muscota Marsh Harmony is a performance that was directly inspired by my neighborhood and community in Inwood, at the top of Manhattan. What I want to do is to harmonize different parts of the neighborhood, whether it be the community, culture, history, and even the environment itself. How this will manifest is through 4 performers, moving through the park space, singing different pitches as well as melodies remembered from their own personal histories. Interviews that I conducted with my neighbors will also be featured, played back through speakers scattered throughout the park. The audience then is free to move through the park and to listen the singers and interviewees relate their perspectives and stories. JB: Make Music New York is all about uniting New Yorkers in our shared social spaces through the power of music and you have identified a unique and site specific performance venue. How is the program integrated into the layout of the park? John: The Muscota Marsh is a reclaimed wetland that sits near the convergence of the Hudson and Harlem Rivers, properly called Spuyten Duyvil Creek. I wanted to site the performance at this place, between land and water, itself a kind of harmoniousness. With this performance, I don’t want to force the sound into the park, I want to place the singers and the pre-recorded interviews as an outgrowth of what would already be there. I see my contribution as a sonic “scrim” over the environment. Our NYC parks are really a shared space for all of us and this performance will hopefully only add to that. JB: What are you most looking forward to and how can Make Music fans best enjoy the performance? John: I’m most looking forward to the warm weather! Make Music New York is always a fantastic day and I hope to take in at least a couple other events before mine in the evening. For people coming to see Muscota Marsh Harmony, I would say come with an open mind and be ready to be surprised by seeing such a pastoral scene in Upstate Manhattan! It’s that time of season where we like to feature each of our Special Projects so that you, the Make Music New York community, can have a better understanding of the many great ways to enjoy our music celebrations on Thursday, June 21st (mark your calendar!). Look for regular blog posts outlining events across neighborhoods and boroughs, featuring amazing and engaging musicians from the New York area. James Burke: Hi Pete! I’m thrilled to be presenting your latest special project “Twilight (for humans)” as part of this summer’s Make Music New York on June 21st. I know that you have worked with MMNY in the past as well. Can you share with our fans some of your history with the festival? Pete Wyer: In 2014 I created a setting of Dylan Thomas’s poem ​”​And Death Shall Have No Dominion​”​ for a headphone​d​ choir. The idea was that singers would each have a specially created app which synchronized their device to an atomic clock and at exactly 11.00am on June 21st it would start playing a backing track ​from which ​singers could choose soprano, alto, tenor or bass ​parts ​or ​play along with an​ instruments. 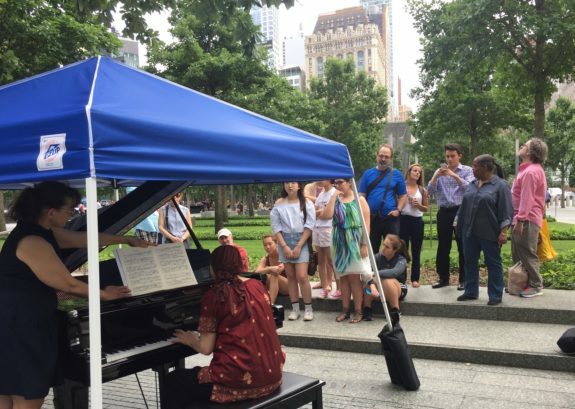 People began singing wherever they were in N​ew York City​ and began walking converging routes to an assembly point at Rockefeller Park​.​ ​S​o a soprano walking down one street might find she was in sync and in harmony with a tenor in the next street. It started out as individuals​ and ​small groups​ ​and ended up with a full choir and band, ​at which time ​everyone took off the​ir​ headphones and all sang together. JB: Back to “Twilight ​Chorus ​(for ​H​umans),” can you explain the program for our followers and speak to the inspiration behind the concept? Pete: I have always been strongly influenced by birds​ong​ at dawn and at dusk. Not only the sound​, ​but the spatiality​ as well.​ ​I​t’s an incredible experience in spring to walk through parkland or woodland at dawn and listen to the ever shifting kaleidoscope of sound as you move​. In​ my native England​, ​this is mostly blackbirds, robins, chaffinches, goldfinches, wrens, song thrushes and in more recent times, parakeets. In 2016 I made a piece for WNYC’s ​”​New Sounds Liv​e” at the Winter Garden which was inspired by ​MIT ​Professor Shigeru Miyagawa’s​ ​hypothesis that human speech is evolved from birdsong. In that piece, ​en​titled ​”​Song of the Human​,”​ I used the pitch, rhythm, tone and dynamic of human speech as a start point. With ​”​Twilight Chorus (for Humans)​,​” I have taken recordings of birdsong, slowed them down and transcribed them for singers. ​During the​ performance​, ​the singers ​will be​ dispersed across an area of Brooklyn Botanical Garden, again synchronized via an app. The audience are invited to experience the piece by moving between the voices – there​ is​ no single version of the piece​ and ​each person’s experience will be unique to them. The piece slowly evolves and brings the singers together at the end with more identifiably ​”​human​”​ music. JB: How can Make Music New York fans enjoy the program and what should they expect? ​Pete: T​he piece will be a unique experience​ for performers and spectators alike. ​I​t begins with sixteen singers spread out, singing simultaneous solos that are transcribed from birdsong​. ​That’s a long way from a Bach chorale! ​B​ut ​it ​ends in a more intimate place with singers gathered together. I always hope my pieces in some way move people toward a deeper connection to each other​ and​ to nature​.​ ​And​ if it makes them smile or touches them in some way, I’m happy. It’s that time of year where we want to feature each of our Special Projects so that you, the Make Music New York community, can have a better understanding of the many great ways to enjoy Make Music New York on Thursday, June 21st (mark your calendar!). Look for regular blog posts outlining events across neighborhoods and boroughs, featuring amazing and engaging musicians from the New York area. This week, we’re talking to Jenny Undercofler, creator of the special project: “WTC @ WTC: The Well-Tempered Clavier at the World Trade Center 9/11 Memorial plaza.” Our Executive Director, James Burke, took a few minutes off of his busy schedule to ask her a few questions! James Burke: Hi Jenny! I’m thrilled that WTC @ WTC, which debuted as a highlight of our 2017 season, will be returning as part of the Make Music New York celebrations on June 21st this summer. What was your inspiration in creating the concept? Jenny: Well, partly it was just playing with names – I am a pianist and I was writing “WTC” for some program or other – and I thought “wow, playing the Well Tempered Clavier on the World Trade Center Memorial Plaza would be epically cool.” And, because it’s Make Music New York, epic things can happen! JB: Make Music New York is all about uniting New Yorkers in our shared social spaces through the power of music and no public space is more essential to the city than Memorial plaza. How is the program integrated into the layout of plaza itself? Jenny: The project integrates four pianos into the Memorial Plaza space – one at roughly each “corner”. What is lovely is that at that time of day – from 5 to 8 PM – there are so many different reasons that people are wandering through that space. People commuting home from work; tourists visiting the city; families who live nearby, with their children and dogs…. JB: What are you most looking forward to in the second incarnation of WTC @ WTC? Jenny: Really, just more of what I enjoyed the first time. I get to see many of my pianist friends and colleagues, and they bring their students and friends, and we get to “nerd out” with JS Bach for a few hours, in public, without the constraints of the concert hall. JB: How can Make Music New York fans best enjoy the performances and what should they expect? Jenny: Really, just pick a time and enjoy one of two ways: either camp out at one piano for the time you have; or divide it up between multiple pianos. Last year, we had pianists ‘cycle’ from one piano to the next, but this year we’re going to have the pianists stay in place, just to make everything a little bit more relaxed. Thank you so much to Jenny for her time, and we look forward to another great WTC @ WTC!